Few weeks ago I had posted about the 1500 rupees laptop. Apple Peel 520 is another cheap product but giving functionalities worth much more than it’s current price. Looking at the title you might be thinking that Apple has come up with another product in the market. But that’s not the case here, it’s a Chinese company named Yosian Technologies which has come up with Apple Peel. Apple Peel will allow you to convert your iPod, which has minimal functionalities of an MP3 player into a gadget which is in the limelight from a couple of years i.e. the iPhone. It sounds cool; but you may doubt it as it’s solely Made In China. Apple Peel is just a small little dock with the size of an iPhone. When you place your iPod into this dock it becomes an iPhone. 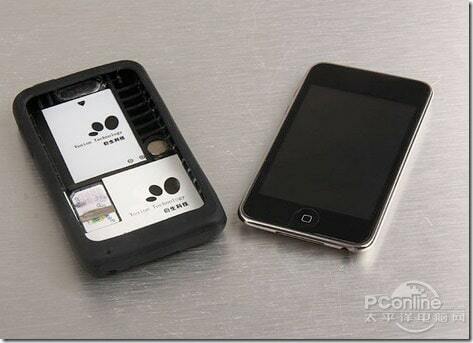 However, don’t expect a full-fledged iPhone from your converted iPod. 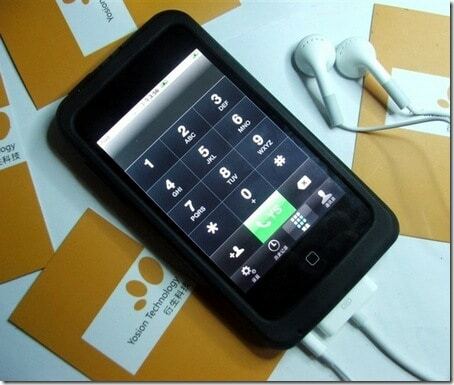 It just gives the basic functionality to call & text. Apple Peel is merely 388 yuan (Approximately 2400 INR). How Apple Peel works ? It’s inner surface has a SIM card slot with which you can insert your SIM into your iPod very easily. You need to install the Yosian Text & call application to use your converted iPhone for calling/texting. You must compulsorily use a headset to talk. Perhaps this is the only disadvantage of Apple Peel along with certain minor bugs. As I had mentioned earlier, this would be one of the obvious doubts you will have in your mind with a product having a sticker at the back ‘Made in China’. Apple Peel isn’t one of those Chinese apps which stop working/giving problems within a span of 6 months or even less. Also, Apple Peel was tested in various Online Chinese Portals including the PCOnline Portal. The reviewers there have given a positive feedback for this dock like product. They have said that the voice quality is awesome & it just feels like talking on a normal phone. So, this product is certainly reliable. You may already be very excited after reading the reliability point, but International users need to wait a bit till China make this product international. It is said that there are legal issues which needs to be sorted out before this product goes global. So, if you are in China grab this product ASAP (As Soon As Possible). Though you need to know a bit of Chinese as the language for the Yosian application is Chinese. Do you think such a low-cost product will hit the market & work in the long run ? Share your views with us on this issue! Sounds pretty cool. But I wish that one could also be able to talk without headsets. Any idea, whether you can get it in India? Its still not legally cleared globally. So it will take some time to come out China. I’d have to try it, I’m not a headset type person, I own an apple Iphone at this time and I wish they’d get there bugs out. Just desired to say that you will have some helpful articles on your website online. You have completed a astonishingly wonderful employment with this 1. Thanks! Wow.. Really its usefulll to all ipod users.. its only for Ipod 3g or 4g too?